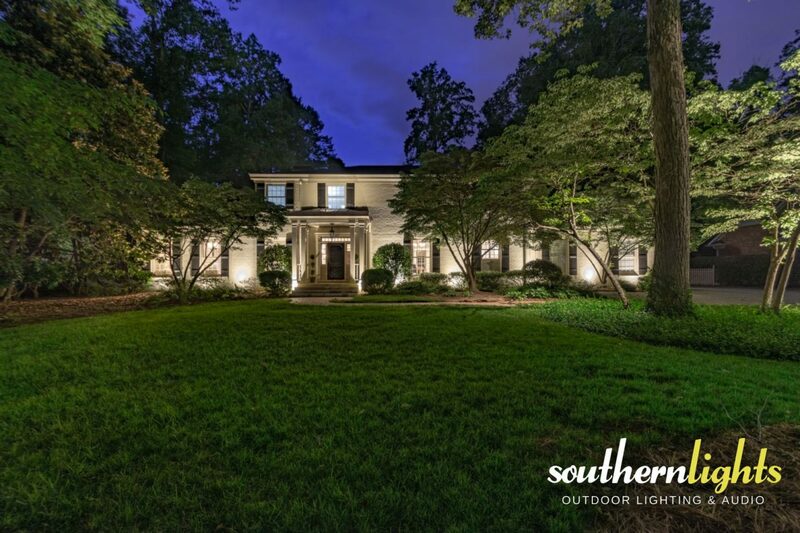 Architectural Landscape Lighting in New Irving Park, NC 27408. PROJECT SUMMARY: This New Irving home sits far off this neighborhood street and has many trees shielding the full view of the home. LANDSCAPE LIGHTING FOCUS: The home’s architecture was always the main focus here although several trees in the front yard were also chosen to illuminate. LOCATION: The lighting designs and installation for this project can be found nestled off the main strip in New Irving Park, NC 27408. As mentioned earlier, this property is somewhat concealed from the street so placing the right number of fixtures in the right location really was more important on this property to pull your eye through the trees and distant from the road. These clients did not want to utilize the traditional style path light along front walkway to ensure guest feel safe and can see where they are going. They were concerned about landscapers and hoses bumping or breaking them over time. Southern Lights discussed other options that would illuminate the brick paver walkway without causing them issues in the future. After a few conversations about fixtures, a tree light was selected that could be mounted above the lower canopy trees shining down onto walkway. This fixture allowed Southern Lights to illuminate walkway with fewer fixtures and also create a really cool effect. The front porch of the home had a very welcoming presence, but created the need for an additional fixture to be mounted to the gutter to properly illuminated the soffits of the home providing consistent light across this New Irving Park’s architecture.